Go HERE or read on for more. NOTE: The March to War mega event is currently on! Until 9am GMT 16th April 2019 you get free shipping worldwide on orders of 20GBP or greater in cart. There is 10% off the entire website including all twenty of our new releases being announced during the event. You need do nothing but add to cart since the discount is on screen. Read the full article including bundles and other offers of up to 50% off HERE or go straight to the website HERE. In full plate mail these Goblins are great for many settings and campaigns such as defending a Temple of Doom or even paired up with Giant Spiders! 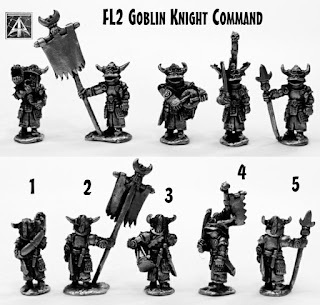 This pack contains four 28mm scale white metal Goblin poses in full plate armour. An officer, a standard bearer, knight with round shield with skull motif and warrior with long shield all with an open hand to take a weapon. 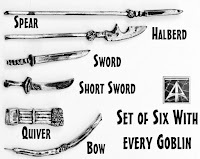 An array of six different weapons are supplied with each Goblin giving you the choice of how to arm them (and spares for your bits box too!). Spear, Halberd, Sword, Curved Sword, Bow and Quiver of Arrows. One Set per Miniature. Get a pack, three packs with a saving or choose one pose (comes with a set of weapons). 28mm scale white metal miniatures approx 22mm height. Great quality, choice and value. These miniatures are not supplied with bases and are supplied unpainted. Go HERE. 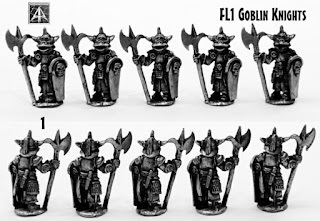 These open handed poses go great with the FL1 and FL2 packs of Armoured Goblins to create whole units and of course you can create whole units of these new miniatures by selecting just what you want in multiples. 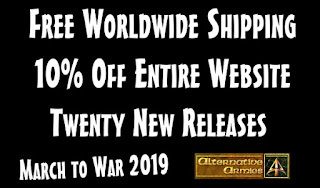 Alternative Armies has a huge choice in 28mm fantasy miniatures and we also have the classic Fantasy Warlord range as well. Have a browse and thank you all for your kind words at our returning to the world ranges thought lost in the mists.